Race Review: Angkor Wat International Half Marathon 2015 [10km] (by 'Ah Girl') | JustRunLah! 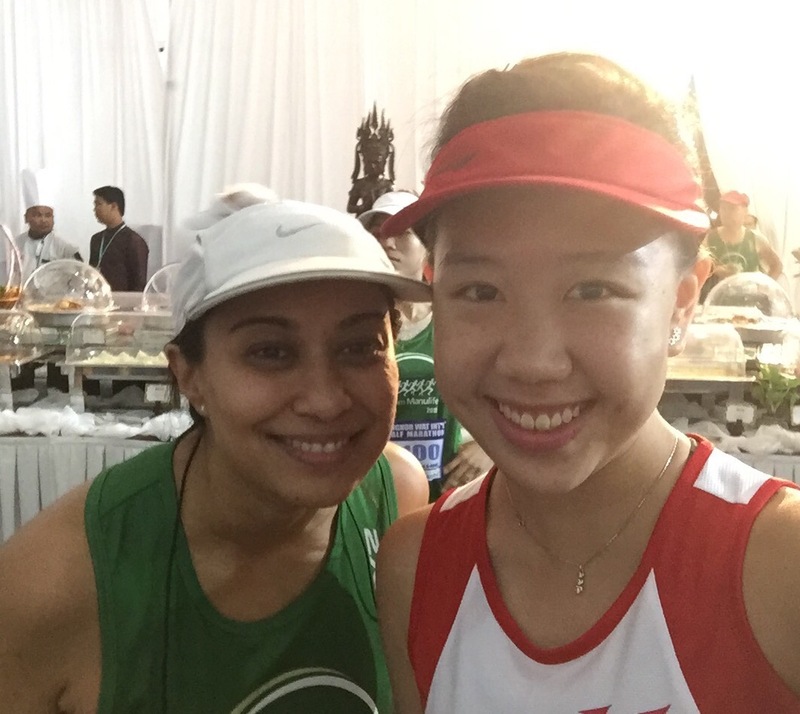 Yesterday, 6th December 2015 was a meaningful day for runners from around the world – some completed their first marathon in their lives, some beat their personal records while some ran for a cause and reason other than themselves. 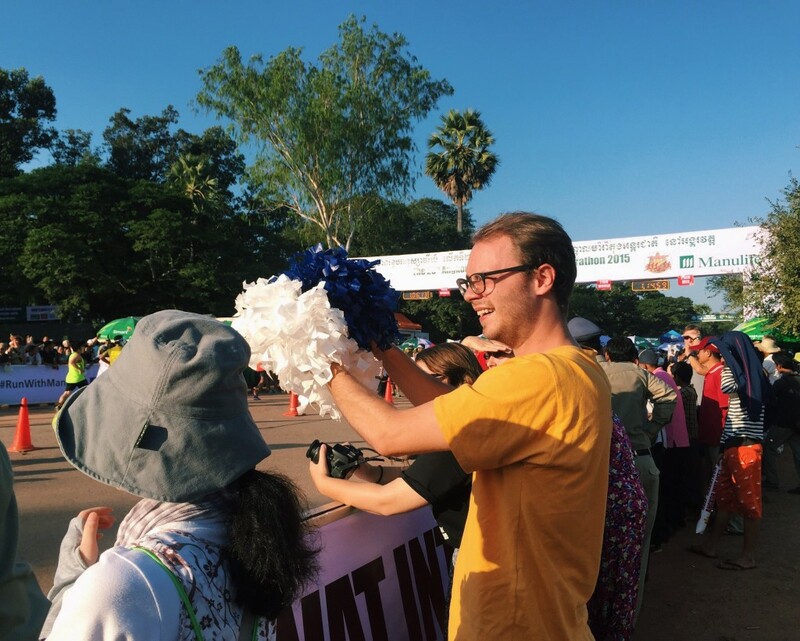 While my counterparts took on the largest annual road race event in Singapore where our garden city transformed into adrenaline-filled running routes, I decided to literally take the path less travelled to end the year of races with one of my world bucket-list races held in the Kingdom of Wonder, Cambodia. Thanks to Manulife team, I managed to get myself registered for the highly subscribed Angkor Wat International Half Marathon 2015. Also, I enjoyed a magical night before race day at the Team Manulife dinner held in the enchanting setting of the Thommanon temple in Angkor Wat. 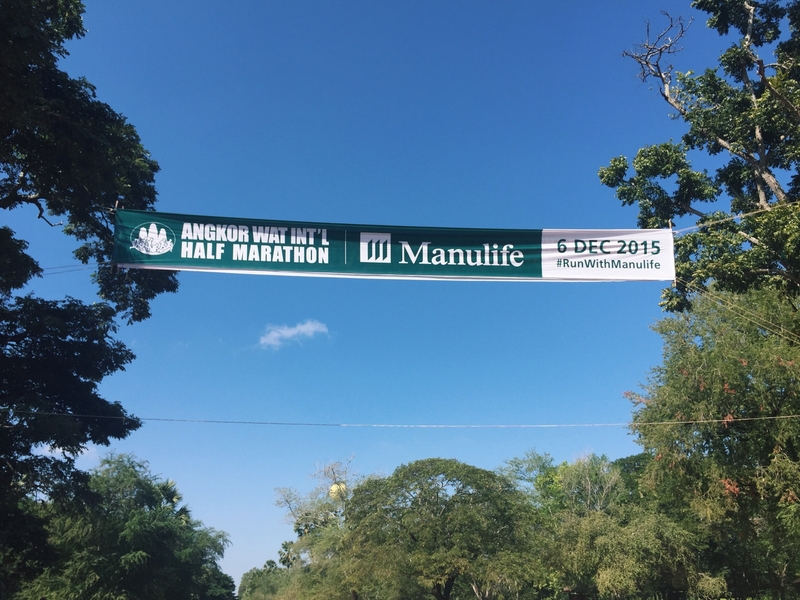 More importantly, I was told that this year is the first year of Manulife’s 5-year sponsorship to AWHM, which is one of the largest fundraising events in Cambodia. 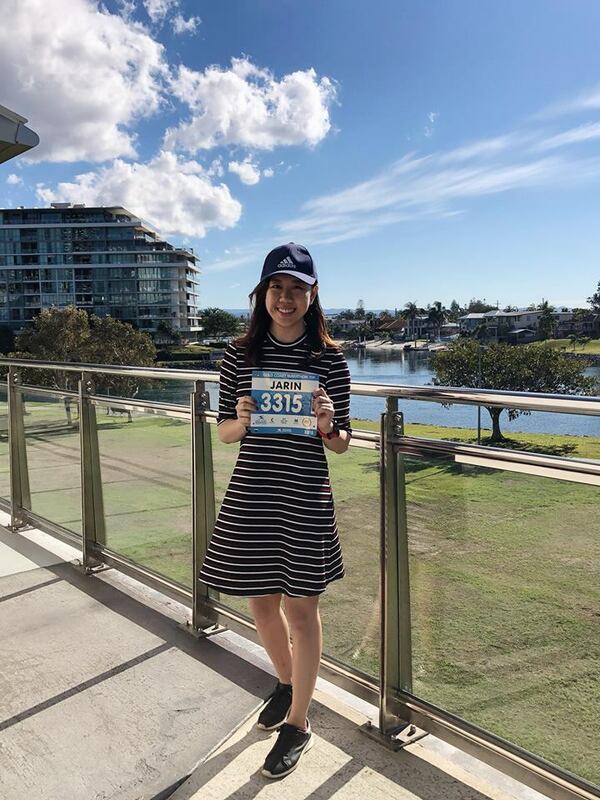 It delights me as my run impacts and raises awareness about the victims of antipersonnel landmine in Cambodia, as well as contributing to the proceeds to Angkor Hospital for Children and other selected beneficiaries to support healthcare and education in the Cambodia. 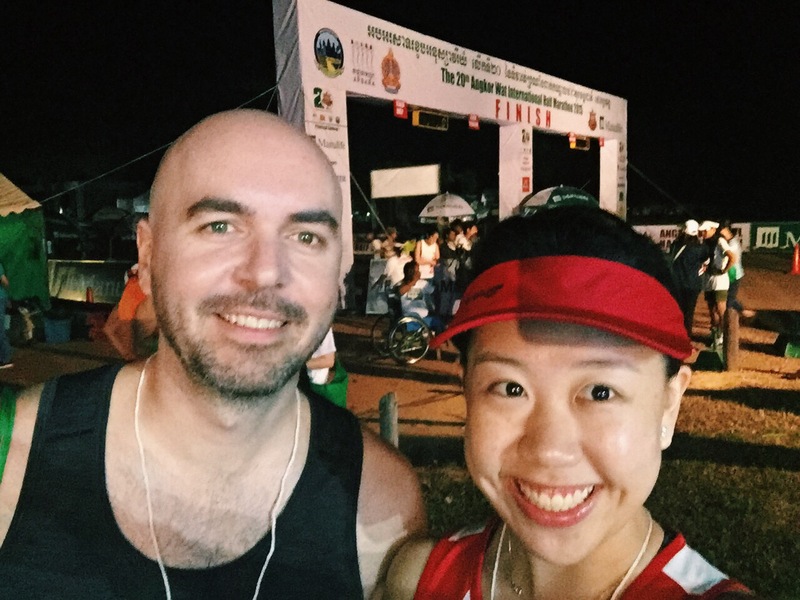 As a first-time traveller to Cambodia and runner in a totally different environment, I was super excited and slightly worried about the difference in cultures, safety, race day transport etc. 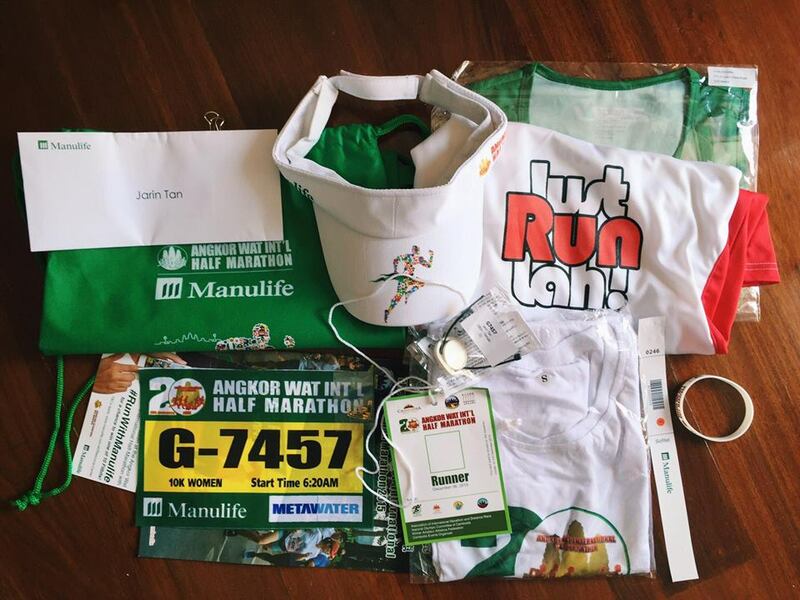 However, all my worries were deemed unnecessary when I knew that all the race day transport had already been settled by Manulife-labelled tuktuks and was told that security will be tight on the actual day. 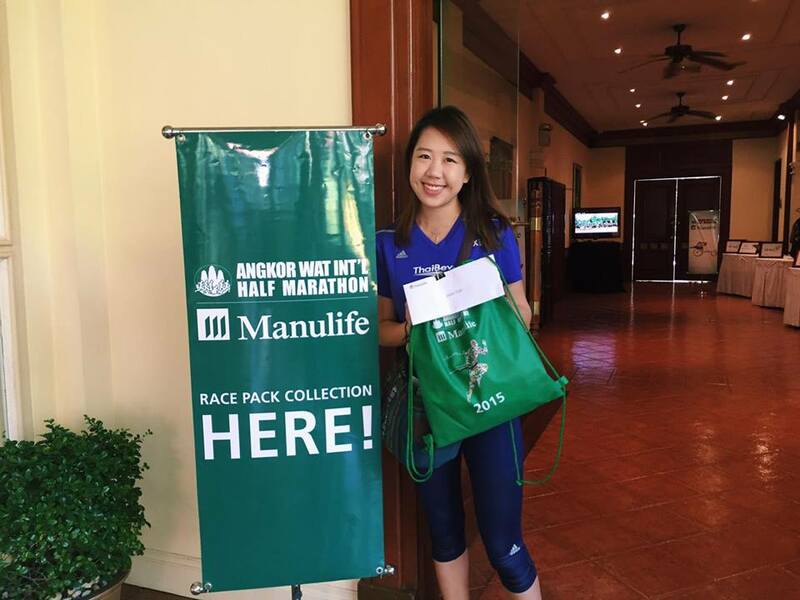 I collected my race pack from my accommodation at the lovely Sofitel Phokeethra Golf and Spa Resort and was greeted by extremely friendly staff from Manulife. It makes me really happy to find out that most of them are showing their support by participating in the race as well, despite their busy involvement in pre-race logistics and management. 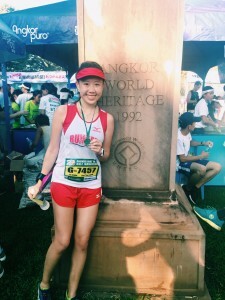 What’s different about this race pack as compared to those in Singapore, is that it includes an access pass into the UNESCO World Heritage Site which all runners have to bring on race day to enter the Angkor Archaeological Park. 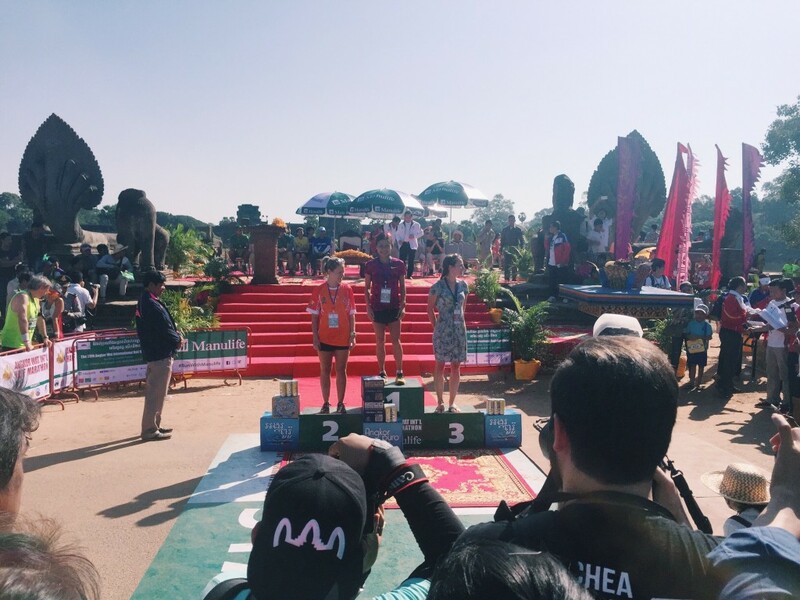 This means that only AWHM race participants are allowed to run in the specified areas of Angkor Wat on race day. How cool is that! Race categories have been increasingly diverse and inclusive of the different physical abilities of participants – the AWHM encourages participants in wheelchair and those with prosthetic limbs to join in the race. I really respect and admire their determination and endurance as they charge with might throughout the course and towards the finish line. 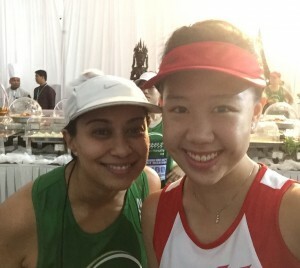 I chose to take part in the 10km instead of 21km because of I had a race a few days ago. It is always important not to overexert and risk suffering from an injury that might cause one to miss out from valuable opportunities like these! 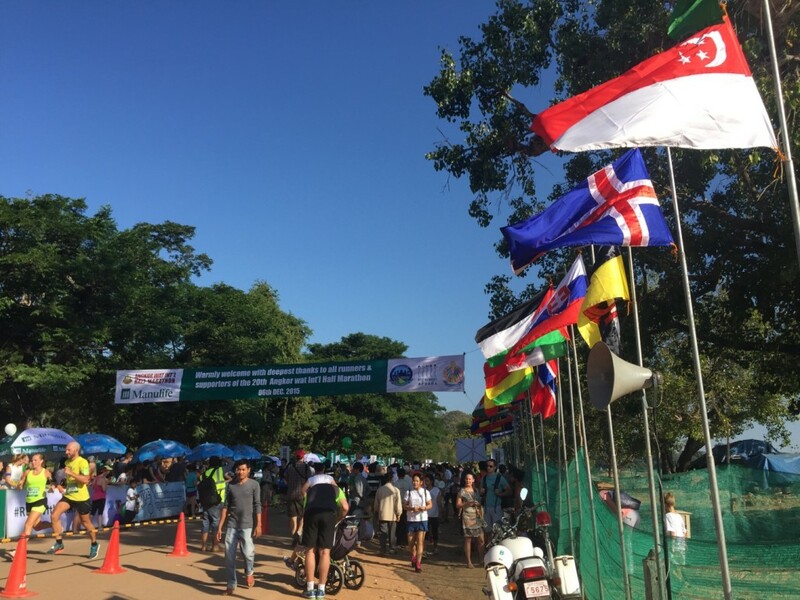 The starting pen was filled with participants from all over the world, wearing shirts belonging to different community groups, speaking in different languages and gathering in the same place to do a single race. It then occurred to me what “international race” really meant and that I was part of this global movement. 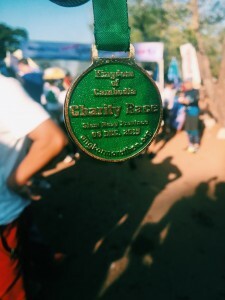 The main reason why runners, including myself, would fly across the globe just for this race, is undeniably for the valuable opportunity of running through the largest religious monument in the world, the Angkor Wat. 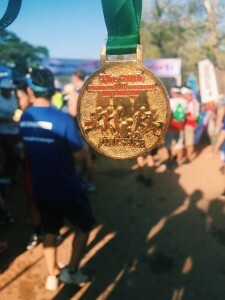 My experience of the 10km felt like a real-live version of the app store game, Temple Run and I can totally foresee myself signing up for the 21km next year to get more sights and sounds of the legendary site. For the 10km race route, it was a straight 5km to and fro, with a U-turn the mid point. Most of the paths were shaded by tall trees and the entire running path was moderately flat, with little or no hills. December was supposed to be the cooling season but my local mate told me the weather in Siem Reap had been rather erratic, fluctuating from sunny hot weather to chilly, windy nights. I guess that was the other main obstacle for me besides the dry, sandy air I had to get accustomed to. Hydration points were definitely sufficient where every 2.5km, one would spot race volunteers smiling and holding out chilled water and isotonic drinks. For the 21km category, there are stations with bananas and energy gels as well. I wished I had stopped to take a few photos in along the route but I simply couldn’t stop the adrenaline rush in me. Well, this calls for a reason to be back in Siem Reap, regardless of being a tourist or runner! Check out the race route for 21km here. The finishing line was filled with many people and along the route, there were kids from the villages who came up to hi-five us! They were super adorable and the local volunteers were extremely gracious and friendly to us as they presented the finishers’ medals, drinks and water. 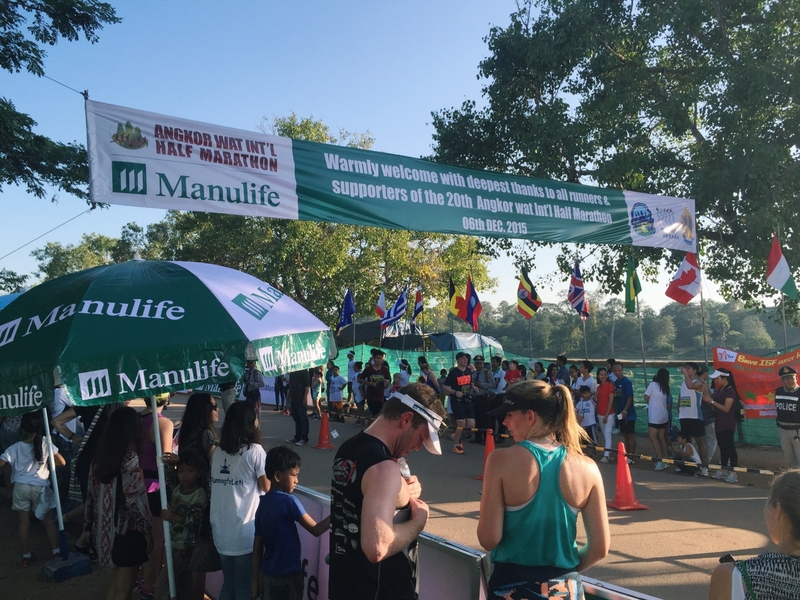 Massage stations were situated at the ending point as well and the Manulife tent was a sanctuary with cold fruits, food and cold towels for almost and immediate recovery. 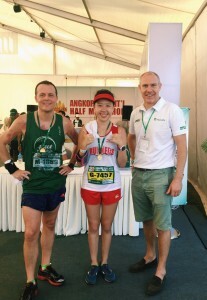 Congrats to Vivan Tang from Singapore who retains her winning title for Women’s 21km from last year! I managed to finish my 10k under an hour and I thought that wasn’t too bad for a race that was in a totally different setting and climate. Now that I am back in Singapore, memories of running through the Victory bridge, sights of Khmer architecture and running alongside with sporting Cambodians and international runners still flood through my mind. It has been a humbling and amazing experience to be part of this world bucket-list race and I will definitely be back for more. Once again, heartfelt thanks to Manulife for this fantastic race experience and for all the months of event preparation and generosity in supporting such a meaningful cause.